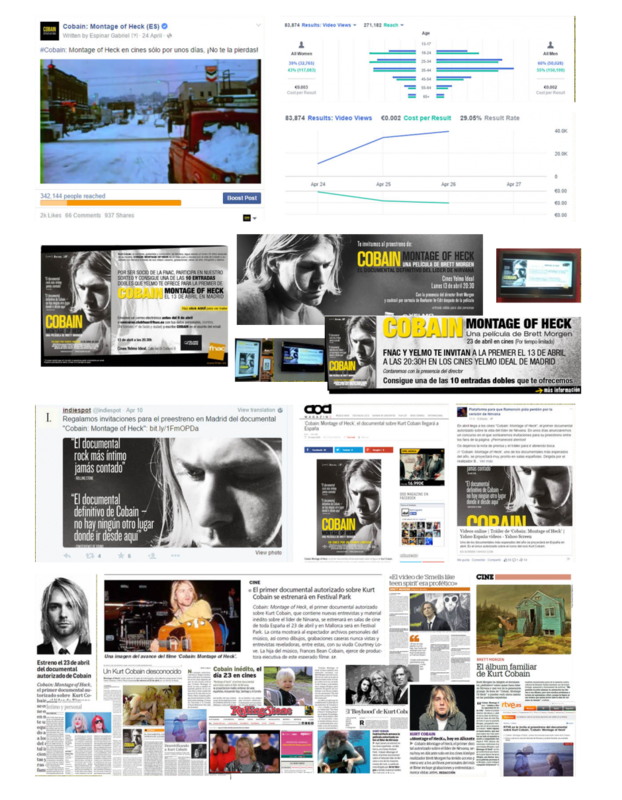 The Film Agency managed the 360º event-cinema promotion and marketing strategy of the live cinema release of Cobain:Montage of Heck in Spain. Hailed as one of the most innovative and intimate documentaries of all time experience, Kurt Cobain like never before in the only ever fully authorised portrait of the famed music icon. Academy Award® nominated filmmaker Brett Morgen expertly blends Cobain’s personal archive of art, music, never seen before movies, animation and revelatory interviews from his family and closest friends. Wildly creative and highly acclaimed, follow Kurt from his earliest years in this visceral and detailed cinematic insight of an artist at odds with his surroundings. Plus, in an exclusive interview for cinema audiences, Brett Morgen discusses his unprecedented, intimate access to Cobain’s family and past. The Film Agency coordinated the entire 360º event-cinema promotion strategy in Spain: on one hand we liaised with exhibitors in order to promote the film in their supports and venues. We also crafted a media plan to boost the Paid Media Activity placing several online campaigns such as Youtube TrueView, Facebook and El Pais in order to promote the film and push the trailer. We fostered alliances and partnerships with several brands and clubs such us Fnac, Pase Ivea, Deezer, Universal Video and Beefeater – In-Edit Film Festival, and Televisión Española who gave us consistent visibility though several contests and communication exchanges. We organized the visit of the director to Madrid which consisted on a press junket day and a live-music premiere at Cines Yelmo Ideal. Last but not least, we activated a grassroots marketing strategy contact the main online music magazines, music blogs and fan clubs, who gave us visibility though contests on their social media profiles and websites. We coordinated all this work with our partner Actúa Comunicación, who achieved massive press coverage nationwide. The core alternative marketing action was a special event on April the 13th at Cines Yelmo Ideal, on one of the most central cinemas of the capital. The event consisted on a presentation by the director Brett Morgen and the music influencer Arturo Paniagua, followed by a Q&A session and a cocktail. This special screening was also accompanied by the live music of a cover-band of Nirvana. More than eight key music promotion partners collaborated on the event.